Here is the Cubs World Series ring. 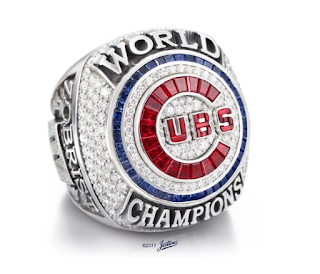 There are 108 diamonds, rubies and sapphires to signify the 108 years that it took the team to get here. 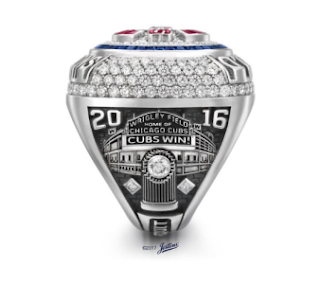 It's the biggest, most expensive ring in MLB history. Manager Joe Maddon says that while it's beautiful ("tasty grande" in Maddon speak), he'll never wear his, claiming he couldn't even steer his car while wearing such a big piece of hardware. EVERYONE who worked for the Cubs organization in 2016 -- including the guys who brought out the tarp during the rain delays and tended the ivy -- will get one of these. That's 1,908 rings. And the last time the Cubs won was 1908. Coincidence? 1. What are you currently reading? In Love with Night by Ronald Steel. Subtitled "The American Romance with Robert Kennedy." Steel promises to take Bobby's life and legacy and put it in some real world perspective. How much of his legend is performance and how much is promise? How to separate the complex and contradictory man from the myth? The contradictions are mighty. As the author notes, Bobby "was an ardent prosecutor who abused the law, a champion of Black pride who allowed the FBI to torment Martin Luther King, a fearless rebel who would not take on an unpopular president until another man cleared the way." I'm looking forward to this book being serious. When reading about the Kennedys, it's easy to slide into either sludge or hagiography. I hope this book rises above both gossip and idolatry. 2. What did you recently finish reading? A Hole in Juan, by Gillian Roberts. Another in the Amanda Pepper mystery series. It's easy to dismiss these books as cozy mysteries, in the Murder, She Wrote vein. But they're always more than that. In this one, Gillian Roberts channels her inner Hitchcock and builds a real sense of tension in an otherwise benign spot: a dance in the high school auditorium. Teacher Amanda Pepper notices her senior English class acting differently. Their teenage dramas are suddenly a bit more dangerous and their pranks take on a darker hue. Are the kids simply swept up in excitement over Halloween, and the annual Mischief Night dance? Or is it something more sinister? This book also reminded me of how hard it is to be an adolescent. How important everything feels when you're on the precipice, about to leap (or fall) from childhood into your adult life. Ms. Pepper's class is reading A Separate Peace, which is a nice touch. 3. What will you read next? I don't know. Maybe I'll reread A Separate Peace.